The Lakach gas field is located in the Gulf of Mexico (GOM), 93 km SE of the City of Veracruz (Veracruz) and 136 km NW from Coatzacoalcos (Veracruz) and 60km NE of Gas Station 5 Lerdo, in water depths ranging from 850 meters to 1,300 meters. 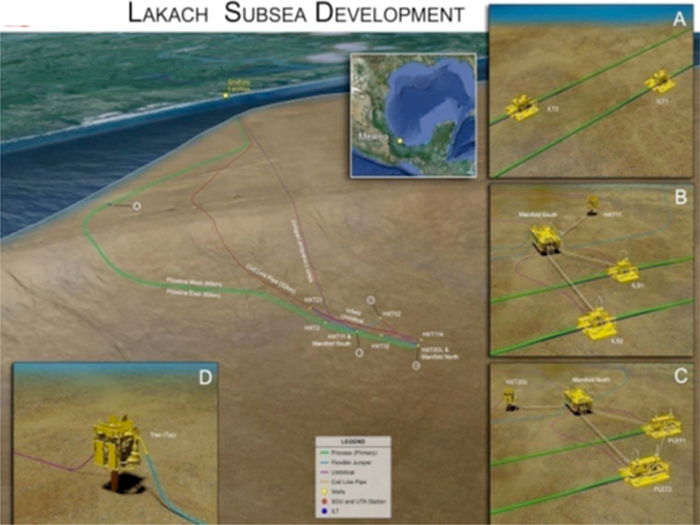 The Lakach field development will have a subsea manifold cluster configuration with seven (7) subsea wells and 65 km of dual 457 mm (18-inch) OD flowlines to onshore gas plant. Tecnoconsult has been involved in the Pipeline Route finalization, Wall thickness design, On bottom Stability Analysis, Stress analyses, Fatigue Analyses, Intervention works Design, Shore approach Design with Horizontal Directional Drilling method. Moreover, Tecnoconsult performed the assistance to the pipeline material procurement services and the bid evaluation of HDD execution.